Resilience is the ability to recover easily from adversity. Some people seem able to do this well and some do not. What makes the difference? It’s a question I’ve often pondered since I’ve had my son. I’ve wondered what I can do as a parent, if anything, to help boost his resilience. It turns out there’s a lot that parents can do. 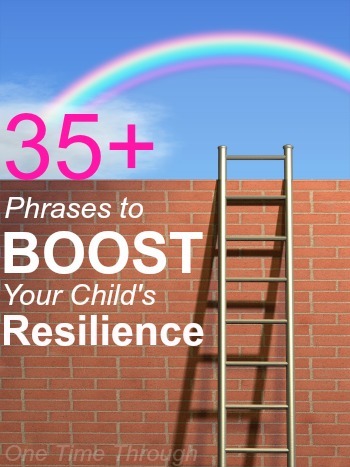 Read our post today to find 35+ ways to easily boost your child’s resilience with the things you say! Let me start with a strange question…Do you hear voices in your head? You know what I mean. The ones that tell you you should lose 5 pounds, or that you should cut back on drinking so many coffees (or other beverages). Or as a parent, the ones that tell you that your kids should be listening better, or eating healthier, or that you should be spending more time with them, or that you should be more patient with them. Or maybe if you’re lucky, you hear lots of positive inner voices that encourage you, compliment you, and comfort you when you are down, stressed out, or disappointed. Where do these voices come from and what do they have to do with resilience? Aren’t these voices just our brain’s way of thinking? Well – yes – and no. Of course, some of them are just our mind chattering away. But, some of them are like record tracks that were recorded years ago on our then newly minted cognitive albums. They may be captured snippets of things people said to us, or that we heard often as children. These voices are often readily recognizable as being our parents’ voices, or maybe even siblings, teachers, or friends’. For example, I can clearly hear my mother telling me to make sure I work hard to get a good job so that I can support myself, and my dad’s voice pops into my head often to say, “This too shall pass, Susan” whenever I’m frustrated or down. Some of these voices are good, and some of them are annoying, but everyone has them – and whether we realize it or not, they can have a huge impact on how we feel and behave. 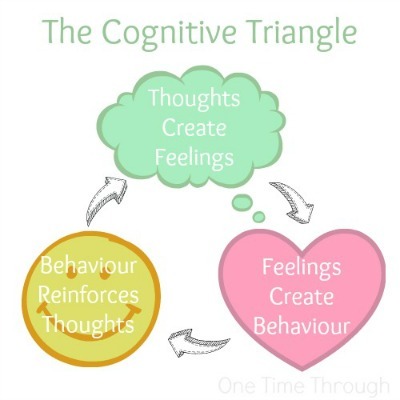 This is often referred to as the cognitive-behavioural triangle (see below). In other words, the inner voices that echo through our minds, actively affect how we perceive our world, and make sense of what is happening to us – especially in times of adversity. The more in control we feel of our lives and ourselves, the better we are able to handle and spring back from stressors – or in other words – the more resilient we are. So it stands to reason, that if we have inner voices that boost our sense of control and self-esteem, we will deal more effectively with the inevitable difficulties in life. How can this understanding help our kids develop resilience? I don’t have to quote any research to demonstrate that the things our parents say to us as children have special sticking power in our brains – and can become powerful parts of our inner voices. You’ve probably already experienced it yourself as a parent, when you’re speaking to your child, and out of your mouth pops something your mom or dad used to say – word for word (and maybe even with the same tone of voice!). And I’m sure you’ve noticed that our children naturally mimic what we say too, sometimes embarrassingly so! Because I like to focus on the positives (a characteristic of resilient people, by the way! ), I’m not going to list all the things we shouldn’t be saying to our kids. Besides, you probably already know most of them anyway – even if they slip out from time to time. Help your child view adversity in a positive way. The hope is that by sharing these words with your child, they will eventually become a part of a positive inner voice. One that will be there to support, comfort and encourage your child – long after you are gone (whew – that was a bit heavy wasn’t it?). And so, without further adieu, here is the list (along with some examples and explanations). I hope you find it helpful! I don’t think we can ever underestimate the power of hearing those words often from a parent/caregiver. e.g. “I really appreciated it when you helped put out the garbage.” According to Diana Loomans, author of What All Children Want Their Parents to Know: Twelve Keys to Successful Parenting , “Children who know how to acknowledge themselves and others are less dependent on the approval of others and have more resources in taking risks and being authentic.” They learn how to do this from seeing us model it! Again – being appreciated and valued. If we can admit to our own mistakes and imperfections, our children will come to believe that it’s okay when they make mistakes too. 5. I believe in you. Research shows that having a close sustained relationship with at least one caring adult who supports and believes in you, and who is a positive role model, increases a child’s resilience (Meichenbaum). 6. You are capable of making good choices. 7. That’s an interesting question…What do YOU think? Both #6 and #7 help children to see that we value and respect their thoughts and opinions. 8. You are capable/loveable/fun/caring/kind/a good friend. These kinds of statements help children to see their positive characteristics and lets them know that we value who they are versus what they accomplish. 10. It’s OKAY to feel sad/angry/upset/disappointed/depressed. Resilient adults are characterized as being emotionally responsive, empathetic and caring (Meichenbaum). When children learn early on that their feelings (both positive and negative) are accepted, they learn to become emotionally intelligent themselves. 11. It’s okay to CRY. 12. You’re feeling [shy/anxious/scared] right now? Everyone feels that way sometimes. This kind of statement normalizes these feelings, while also expressing that they are not permanent characteristics that cannot be changed at some point. 13. I have a hug for you. Would you like it? Asking a child for permission for hugs and kisses, empowers them by teaching them that they alone are in control of their body. 14. Listen to your gut and trust yourself. This powerful statement sends a clear message to children that we value their judgement and that they can use their emotions (their gut instincts) to help them understand right from wrong. 15. YOU are the only one who controls how you feel/what you say/how you act. I use this one when my son gets angry and says things like, “You made me angry.” or “You made me upset.” I would rather him come to realize that he can control and choose how he feels and reacts to things, instead of adopting a blaming attitude. 16. We all make mistakes sometimes. What can you LEARN from this mistake? How can you make this situation better? These kind of statements help children to view mistakes as problems to be solved, instead of failures. Reframing is a way of shifting focus from the cup half empty to the cup half full attitude. 17. Try your best. Winning isn’t everything. Helping kids focus on their efforts, instead of their accomplishments, helps them feel more in control and benefits self-esteem. 18. Will this matter still in 5 minutes? 5 months? 5 years from now? This is just a great question to ask kids to help them keep perspective when they are feeling upset or down about things that are happening to them. 19. And this too shall pass. 20. Anything worth having, is worth waiting for. The perfect saying to encourage and support children as they work towards longterm goals. 21. If you wait long enough, there will always be a break. My friend Lisa told me that she uses this piece of family wisdom when her son becomes impatient to cross a street. But it can also be a metaphor for life’s ups and downs! 23. You can be anyone you want to be, and do anything you want to do. Words that convey a sense of optimism and which communicate a hopeful outlook on the future, model the kind of thinking that resilient adults do (Meichenbaum). 24. It’s the little choices that we make each day, that take us where we want to go tomorrow. 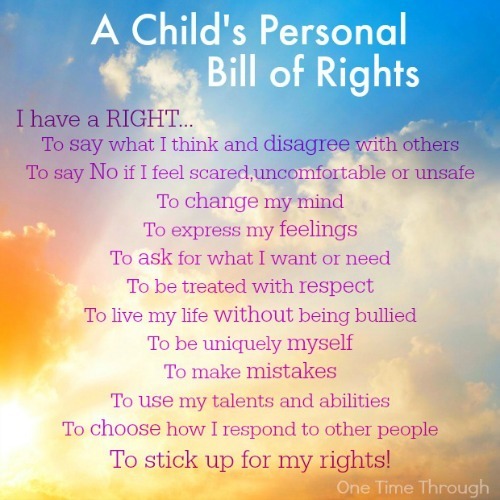 This saying helps children to view themselves as being in control of their lives and futures. Research also shows that resilient people “take incremental, purposeful actions” and “strive to achieve important personal goals.” (Meichenbaum). 25. When people are hurtful, they are usually full of hurt themselves. Helping children to see the hurtful reactions and behaviours of others as being due to emotional pain that they are dealing with, can help children become more empathetic and tolerant of others. It can also help them stay calm when faced with disrespectful or rude behaviour. All three of these abilities are characteristic of resilient people (Meichenbaum). 26. You can pick your nose and you can pick your friends, but you can’t pick your friends’ noses. My less than useful, but pretty funny contribution from my goofy husband when I asked him if he had any “words of wisdom” about friendships! I thought we could use a humour break! That being said, having a sense of humour, including being able to laugh at yourself, is a part of being socially intelligent – also associated with resilience (Meichenbaum). 27. Courage is being scared, but doing what needs to be done anyway. 29. Give it a try. You can always change if it doesn’t work out. According to the Meichenbaum study, the “ability to try alternatives indicate[s] adaptability to stress.” – another characteristic of resilient people. 30. You can do anything you set your mind to. 31. You’re stronger than you think. 32. You must be proud of YOURSELF. Instead of telling your child you are proud of them, try saying this instead. It conveys the same message, but puts the focus on the child evaluating him/herself, instead of external approval. 33. If you want others to respect you, you must first respect yourself. 34. The most IMPORTANT opinion anyone can have of you – is your own. 35. Today is a good day, even if it rains. This was my dad’s favourite expression. It’s helped me to always look on the bright side of things (and inspired my blog name). Laura from Sunny Day Family. 36. Start out how you can hold out. Click HERE to get a FREE printable PDF of this list. If you are looking for the perfect book for kids (and adults) of all ages to stimulate discussion around resilience, you have got to read this continuation of the classic, The Little Engine Who Could, called I Knew You Could! : A Book for All the Stops in Your Life. Say, “I think I can!” and you know what? 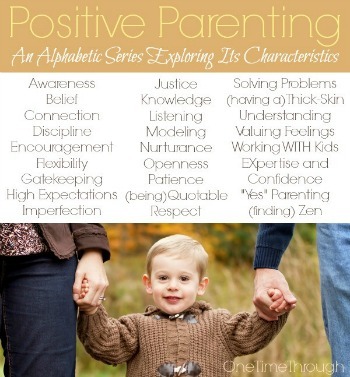 I hope you enjoyed reading today’s Positive Parenting: An Alphabetic Series post: Q is for Quotable. I hope you enjoyed browsing through this list and that I’ve saved you some time finding positive parenting resources for support, answers and encouragement! P.S. A big thanks to Anne, Katie, Jenna, Verena, Lisa, Laura, Leah, Gabrielle, my husband, and all my other friends and family who patiently answered my questions about their inner voices! If you’re looking for even more posts on raising resilient kids, be sure to visit Imperfect Families.com for some fantastic links from mental health professionals. Source: UNDERSTANDING RESILIENCE IN CHILDREN AND ADULTS: IMPLICATIONS FOR PREVENTION AND INTERVENTIONS, Donald Meichenbaum, Ph.D.
Ha – my father always said #26 too! lol! But this is seriously a great list – pinned it so I can keep going back to it! Dear Sue , your list is amazing. It’s highly motivating and doesn’t require much effort to practice. I always motivate myself by telling myself “Yes! You can do it.” It has actually helped me achieve almost everything and now I tell my kids the same. I found this on Pinterest and I’m so thankful! I have a 4, 2,1 year old and life is crazy around here. I get overwhelmed and not resilient myself. I see it so much more after reading your list. I’m going to work on incorporating these into our daily lives. 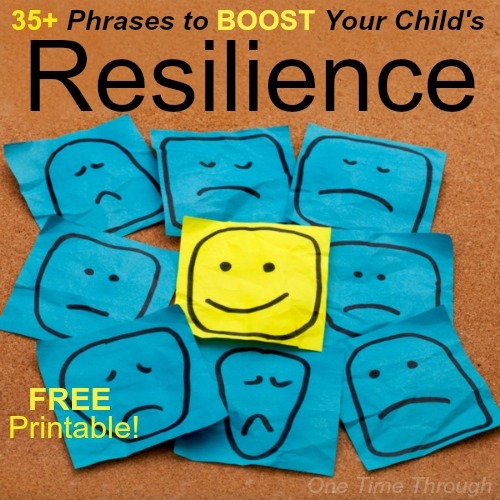 Not just for my kids but for myself, to teach us all better resilience.